Nnamdi Kanu, the leader of the Indigenous People Of Biafra, who has been the prime mover of the restoration of the Biafran nation in recent times, was on the 14th of October 2015, kidnapped at Golden Tulip Essential Hotel, Ikeja by some members of the Department of State Security Services DSSS and his belongings, travelling documents, $2,200 and 7000 naira, made away with. Since the incident, it has been an awful show of shame and ignominy as the Nigerian judicial system and the executive arms of government have proven themselves to be grossly unlettered in both knowledge of law and its application. 19th October 2015, was the first time he was arraigned in court, though secretly at the Magistrate Court Wuse. He was charged for Criminal conspiracy, Managing & Belonging to an Unlawful Society and Criminal Intimidation contrary to section 97, 97b and 397 of the Penal Code (applicable in Northern Nigeria). The court granted him bail with stringent conditions including getting a civil servant of Grade 16 who owns a landed property within Abuja Metropolis and in the sum of 10 million naira as his bail surety. The bail conditions, though as stringent as it could be, was met, yet he was not released. On this, Mr. Kanu’s lawyer, Barr. Vincent Obetta lamented ‘’I have not seen nor heard of any place where a court grants bail and the person is not released. Under UN and Africa charter, it is enshrined that once bail is granted, you release the person upon meeting bail conditions. We are sliding to days of Decree 2 and 4 of 1984. This is pure Dictatorship’’. The second court proceeding was on the 18th of November 2015. The trial was stalled following the failure of the DSS to produce Kanu in court. The case was adjourned till November 23rd by Magistrate Shuaibu Usman. On November 23rd 2015, the third day in court, the court’s magistrate, having the full knowledge that Nnamdi Kanu had been granted bail and bail conditions met, continued to listen to both counsels. The DSS requested the Magistrate to discontinue the trail as they have obtained an order from the Federal High court, Abuja to detain the accused in its custody for 90 days. At this, Mr. Obetta the lawyer to the accused Nnamdi Kanu objected, stating that the prosecution did not present any information from the Attorney-General of Nigeria Federation who has the authority to approve such. At this point, the Magistrate adjourned the case till December 1st, 2015 for ruling. The forth time this case was brought to the court was on the 1st of December 2015. This supposed reputable court stalled the case again, insisting that due to the Magistrate’s father’s death which occurred on the 26th of November 2015 (5 days before the hearing), the Magistrate is not disposed to appear at the court. According to the court Registrar, December 16th has been fixed tentatively for the ruling. Fifth day in court was on Wednesday, December 16th 2015. 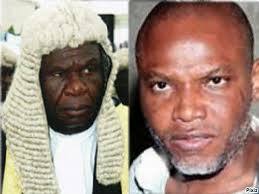 The Magistrate, Shuaibu Usman, struck out all criminal charges leveled against Mr. Kanu and discharged him. On this, Mr. Idakwo, counsel to State Security Services argued that further investigations by the SSS had shown that charges against Mr. Kanu could not be entertained by the Magistrate court due to lack of jurisdiction as he had already informed the Federal High Court in Abuja that Mr. Kanu was sponsoring terrorism against Nigeria. He also claimed to have evidences of bank accounts owned by the accused person where monies (both in dollars and pound sterling) were allegedly used for financing acts of terrorism against the country. After the hearing, the judge promised to look into the matter but fixed December 17th 2015 to deliver ruling on Mr. Kanu’s bail. The sixth court date was December 17th 2015, this time at the Federal High Court in Abuja. On this day, Justice Adeniyi Ademola ordered the unconditional release of Mr. Nnamdi Kanu stating that no law permitted the SSS or any other security agency to detain him for so long without trail. He further ruled that his continued detention without trial violated Section 158 of the Administration of Criminal Justice Act 2015 and Section 35 of the 1999 constitution. All these Orders and Rulings only meant a witty remark to the federal government who has no regards whatsoever for the rule of law as it filed a six-count fresh charge of treason and managing the affairs of ‘’an unlawful society’’ against Nnamdi Kanu barely 24 hours after Justice Adeniyi Ademola of the Federal High Court, Abuja Division, ordered Kanu’s unconditional release. Seventh court date, December 23rd 2015, was all drama in the court. The judge of the Federal High Court refused hearing the fresh count charges against the accused, saying that it was needless, as the federal government had repeatedly disobeyed previous court rulings. On the other side, the accused totally rejected the moonshine proceedings as he said ‘’I will not sacrifice the due process of the law founded in the principles of natural justice upon the altar of speedy release from detention. In other words, I will rather remain in detention than subjecting myself to a trial that I know amounts to perversion of justice. Previous court judgments and rulings have been delivered by competent courts of law in Nigeria in my favour which the DSS failed to obey nor implement. On that premise, I am not ready to stand before this court for trial because I am convinced that the outcome will go the way of the previous ones. Therefore, I have chosen to remain in custody until justice prevails in my matter in the interest of justice’’. This speech unleashed gross mortification to both the judge and federal government as the judge agreed with the accused and remitted the case file to the chief judge of the court to reassign it. The judge said, ‘’If any of the parties has no confidence on the court, he has the right to say so. …after all, justice is rooted on confidence. The Eight court date, which was on the 25th of January 2016, though yet to be convicted, the accused was arraigned in court with handcuffs. This time, the case has been reassigned to Justice John Tsoho who had on January 20th, ordered that Mr. Kanu be remanded in Kuje prison. Mr. Tsoho adjourned the case to January 29th 2016 to hear Nnamdi Kanu’s bail application. On the 29th of January 2016, the ninth court date, while everyone was waiting at the federal high court Abuja for Mr. Nnamdi Kanu to be brought to court for the hearing of his bail before Justice John Tsoho, he was arraigned in the court at the eleventh hour by Warders in Kuji Prison. On hearing the case, John Tsoho, justice of the federal high court, Abuja, turned down the bail request by Nnamdi Kanu, accusing him of being a national threat to Nigeria. Nnoruka Udechukwu, senior advocate of Nigeria (SAN), urged the court to release him, stating that the offence he was alleged to have committed was a bailable one. Udechukwu argued that the Criminal Justice Act, 2015, stipulated bail for anyone not accused of a capital offence. He said that the offence of which Kanu was accused was a “civil rights” issue, adding that the right to agitate is guaranteed in a democracy. On the court proceeding, which was on February 19th, it was an impressive one, the Court turned down the request by the federal government, to allow it’s witnesses wear masks during the trial of Nnamdi Kanu, The trial judge, Justice John Tsoho said the prosecution did not furnish the court with enough evidence to show that, it’s witnesses were in danger, other than a mere mention by the prosecutor that his witnesses are scared for their lives. Justice Tsoho said he agreed with the Counsel to the accused persons that the demeanor of a witness is important in helping the court decide if he is a witness of truth or otherwise. He also said that the state has all of the resources to ensure that the witnesses in the suit are protected. The judge however says his order as granted at the last sitting allowing lawyers, journalists and close relatives of the accused persons, still remains. In bewilderment, on March 7th 2016, the eleventh court date, Justice John Tsoho ruled against his pronouncements on February 19th, when he refused masking of the witnesses or barring members of the public from the trial. The judge also ordered the use of non-public routes and rest rooms by the witnesses, he adjourned the case till the 9th of March for hearing. That marked the first time a judge would be overruling his own judgment. Read also:JOHN TSOHO THE CORRUPT JUDGE: BUHARI'S WILLING TOOL OR UNLEARNED? On the 9th March, the twelfth court date, Justice John Tsoho adjourned the court, fixed the date after the prosecuting counsel, Mr. Mohammed Diri, indicated interest to oppose the motion. In the circumstance, the hearing of arguments on this motion is adjourned till April 5, he said. Earlier, Chief Chuks Muoma (SAN), Counsel to the defendants announced to the court on the pending motion. "My Lordship, after consultation with my clients, we agreed to appeal the ruling of the court given on Monday that prosecution witnesses can testify behind the screen. In furtherance to that, we consider it necessary to file this motion for stay of trial pending the determination of the appeal." "The appeal against the ruling of the court was filed on March 8th and the motion for stay was filed March 9. The prosecution team has been duly served, he said. Muoma further said "the practice is that once this kind of application is filed, the court should naturally adjourn the matter.’’ On his part, Diri said that the prosecution required time to respond properly to the application. "My Lord, we will need time to respond to the motion for stay of this trial. Today was fixed for the commencement of trial, and we have brought our witnesses to court to start the trial only to be served this application this morning in the courtroom,’’ he said. Again, April 5th, the thirteenth court date, The presiding judge Justice John Tsoho arrived and climbed the bench at about 10:10 am, Barrister Chuks Muoma told the court that the applicants will rely on the facts contained in the filed application. He said that the letter attached to the affidavit is exhibit MD3. He told the court that the defendants also rely on all the positions in the said affidavit and said, the two written addresses was in pursuant of this affidavit. On the fourteenth court date, which was on April 26th, the trial judge, John Tsoho, ruled that the application did not follow due process and was not based on the facts of the case. He said he would continue to hear the case on a day-to-day basis until a higher court orders a stay. He adjourned the case again to June 21. Nnamdi Kanu's legal team headed to appeal court On 25th March, which was the fifteenth court date, Ifeanyi Ejiofor had approached the Appeal Court to strike out the rulings of Justice John Tsoho of the FCT Court, citing him as been biased against the backdrop of his refusal to grant their clients bail, the reversal of his previous ruling against masked witnesses and then prayed the court to reassign the case to another competent judge. The Court of Appeal on the 25th May, 2016, which was the fifteenth court date, ruled against the application filed before it by the detained leader of the Indigenous people of Biafra and Director of Radio Biafra, Nnamdi Kanu, through his legal defense counsels, after reserving judgement during the last court session, refused him bail. Since the appeal dismissed the application, the case is now over to Justice Tsoho who on 26th April adjourned the case till June, 20, 21, 22 and 23 for continuation of trial. Since the arrest of Nnamdi Kanu on 14th October 2015 which has taken the long period of 9 months now awaiting for justice to prevail and a possible count of fifteen times of arraigning him in court, there has not been any effort shown so far by Nigeria judiciary in granting him justice or fair hearing as the law required. The incompetence and injustices of the Nigeria judiciary over the case of Nnamdi Kanu as long listed above is the most incredible and an abhorrence act against Nnamdi Kanu, and a slap on Nigeria and international laws. The sixteenth court date was on the 20th June 2016, S. Labaran, who stood in for the DSS, sought for another case adjournment as he argued that he will need more time before he can respond to the motion that was served by the defence that morning. To his excitement, the judge over John Tsoho adjourned the case to September 26 to 29 for hearing on the motion on notice and commencement of trial. Since the arrest of Nnamdi Kanu on 14th October 2015 which has taken the long period of 11 months; awaiting for justice to prevail and a possible count of sixteen times of court hearings. There has not been any effort shown so far by Nigeria judiciary in granting him justice or fair hearing as the law required. The incompetence and injustices of the Nigeria judiciary over the case of Nnamdi Kanu as long listed above is the most incredible and an abhorrence act against Nnamdi Kanu, and a slap on Nigeria and international laws. This has drawn the judiciary into the mud as one cannot gain fair and straightforward hearing from the Nigeria judiciary. On Monday 26th September 2016, comes another court hearing when justice John Tsoho will proceed with the court proceedings which he adjourned since 20th June 2016. As Nnamdi Kanu heads to court, we challenge John Tsoho to embrace justice and equity as a custodian of it.